Silverton's famous son, Homer Calvin Davenport, was an internationally renowned cartoonist in the late 19th and early 20th Centuries. He was born in the Waldo Hills region south of Silverton on March 8, 1867. He grew up in Silverton, but spent much of his youth on GeerCrest Farm, his mother's family's homestead. The Davenports and the Geers had been living in the area since the pioneer settlement days. Homer, however, left Silverton to make his way in the world, fulfilling his desire to become an editorial cartoonist... inspired by his mother's appreciation for the art form in general, and the work of Thomas Nast in particular. From Oregon, he headed to San Francisco where he worked his way up as a newspaper artist for William Randolph Hearst's syndicate. Davenport followed in the footsteps of the pioneering political cartoonist Thomas Nast. As noted in Davenport's obituary, the Silverton native "did for San Francisco what Thomas Nast did for New York," helping bring down corrupt political bosses. Later, Davenport transferred to New York himself, taking on the political establishment. His cartoons frequently focused on the sugar, tobacco and oil trusts taking advantage of Uncle Sam and the average man. William McKinley's campaign manager in the 1896 election, "Dollar Mark" Hanna, (R-Ohio) was relentlessly portrayed with a businessman's checkered suit, with hundreds of little dollar signs filling in each square. His drawings' bite struck a chord with the public and dismay with his opponents. Such opposition came in the form of U.S. Senator Thomas Platt, (R-N.Y.), who cajoled the New York State Assembly into attempting to pass an "Anti-Cartoon Bill." The bill did not move forward, perhaps due in no small part to Davenport's own retaliation: "No Honest Man Need Fear Cartoons." Homer Davenport authored several successful books, including two collections of his Hearst cartoons in 1898, and again in 1900, the latter specifically dealing with the influence of monopolistic corporate trusts. Titled "The Dollar or the Man: The Issue of To Day," it is sadly as relevant in our day as it was in Homer's day. Homer's work also had a profound effect on the direction of America's highest office. His cartoon depicting Uncle Sam and Theodore Roosevelt ("He's Good Enough For Me") has been assessed as one of the determining factors of Roosevelt's election as president. It was Roosevelt who pulled strings to allow Homer Davenport to travel across the world to pursue his interest in Arabian Horses. Davenport's "quest" to the lands of the Bedouin Tribe (in what is now Syria) has been fruitful for the entire American horse community... Many Arabian Horses in the United States are descended from the 27 he was "gifted" in 1906 by the Bedouin leaders he befriended. 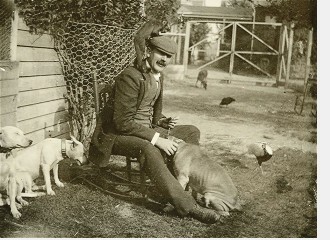 His horses were kept at Red Gables, his farm in Morris Plains, New Jersey. "My Quest of the Arab Horse," (1909), profiled his journey to the desert. Originally written as a series for Lady's Home Journal, it was adapted to book form, and remains in print to this day. His autobiography "The Country Boy," (1910), detailed his life growing up in Silverton. He also provided the illustrations for Albert Spaulding's 1911 book on the history of Baseball, "America's Favorite Game." Additionally, he wrote numerous columns and articles for a wide range of publications over his brief life span. Much of this material was used by Davenport on the lecture circuit, where he was in big demand. Tragically, Davenport died at the age of 45 to pneumonia. In 1912, he died several weeks after drawing a cartoon about the sinking of the Titanic. His headstone is located in the Silverton Cemetery. His legacy, however, endures. Homer Davenport Days began in Silverton in 1980. Every year, the celebrations have kept Silverton's young and old in high spirits. The Cartoon Contest held at the festival began a few years later, and has a routine helping of cartoons from all over this planet. Davenport's presence can also be seen on view in the Silverton Country Museum. The Silverton Mural Society maintains two Davenport-related masterpieces on the walls of Silverton, both by local artists: a biographical mural by David McDonald (First St., near Lewis St.) and the Davenport's Arabian Quest centennial mural by Lori L. Webb (Water St. on the historic Wolf Building). The GeerCrest Foundation, has an aim in preserving the local history of Waldo Hills, and Homer is an important part of the archival collection on the GeerCrest site. The highly well regarded Davenport Arabian Horse bloodline is continually promoted by Davenport Arabian Horse Conservancy and (in Oregon) by Central Pacific Al Khamsa. In 2006, Silvertonian Gus Frederick researched and annotated Davenport's 1898 large format book "Cartoons By Davenport", published by Heron Graphics. A second edition is in the works, with publication in 2012, the centennial of Davenport's passing. By continuing public awareness of Homer Davenport's craft and creativity, this piece of unique American culture is kept alive for future generations to learn from.